Sometimes when we’re building an application we run into a situation that would benefit from a schema-less database. Below is an app that has different kinds of product records including books and videos. We need to store different information based on the type of product. For a book we want to store the author while for videos we want to store a rating and a runtime. This information is currently stored in a description text field in the database which isn’t very efficient and gives us no way to extract these attributes and act upon them individually. We could make each of these attributes a separate column in the database but this can quickly get out of hand as we introduce more types of products to our application. How do we best deal with this situation? At this point we might consider switching to a NoSQL database such as MongoDB but as our application uses Postgres we can try hstore instead. This allows us to store a hash of attributes in a single database column. Hstore isn’t just a serialized hash in a text field, it provides a multitude of operators and functions that we can use to query and interact with this data. We’ll add it to our application so store data related to each product type. First a couple of notes about our application. We’ve already configured it to use Postgres as its database as we showed in episode 342. In our application config file we’ve uncommented the line that sets the schema_format to sql as the schema won’t be simple enough to represent in Ruby code. # Use SQL instead of Active Record's schema dumper when creating the database. To add hstore to our app we’ll use the activerecord-postgres-hstore gem. 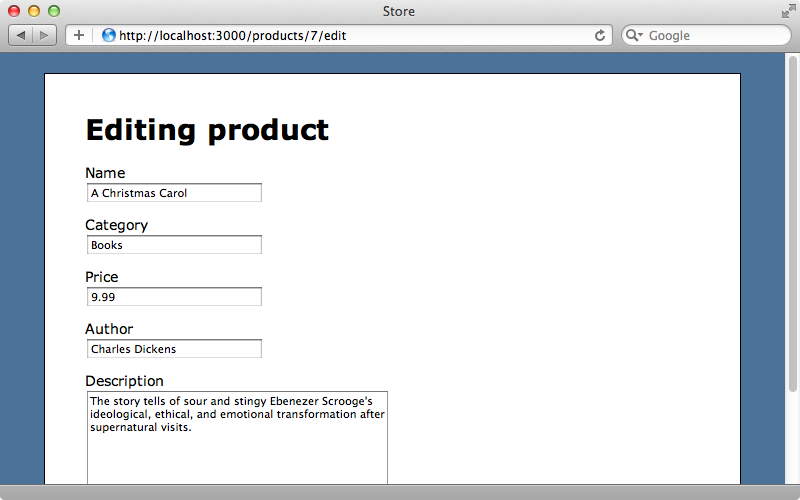 When Rails 4 is released this will have built-in support for hstore which will make this gem unnecessary. Installing the gem is done in the usual way, by adding it to the gemfile and running bundle. Next we’ll need to run a generator to set up hstore. This generates a migration that adds the hstore extension to our database. Before we migrate the database we’ll create another migration that adds a properties column to our products table. This will be used to store the dynamic attributes that are different for each type of product and will be of type hstore, which is will be a valid datatype once we’ve run the other migration. There’s one more migration that we’ll create now which adds an index to our new column as it’s generally a good idea to index these columns. This migration adds a migration to the properties column using the GIN function. We could use GiST here instead and there’s more information about the differences between these in the documentation. With all these migrations in place we can now migrate that database by running rake db:migrate. 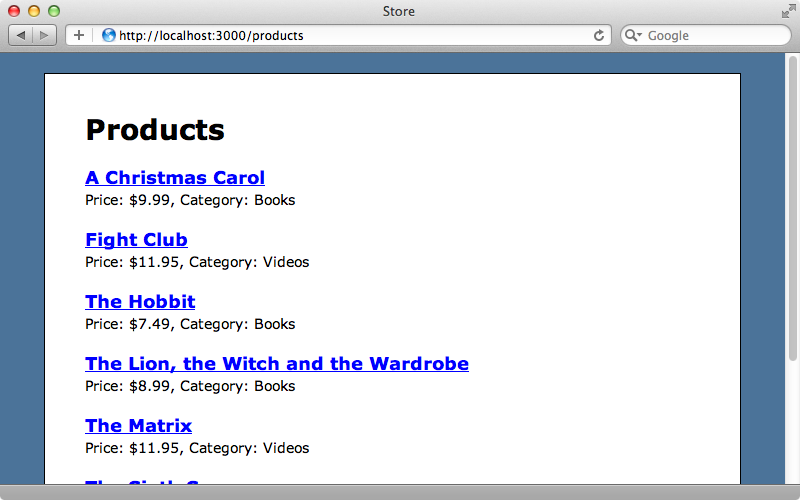 We’ll start by demonstrating hstore in the console. First we’ll fetch a product. This now has a properties attribute which will be nil be default. We can set this attribute to a hash of values. The product we’ve fetched is a video so we’ll give it rating and runtime values then save it. This will save this information into the properties column in the database. When we reload the product and check its properties we’ll get that hash of values. One important difference about the hash that’s retuned from the database is that the keys and values are all strings, even though we used a symbol and an integer when we set it. Hstore only stores string values so if we want to store a boolean, date or integer value we’ll need to convert it manually afterwards. Another thing to be aware of is that the properties object will be a different object each time we fetch it. If we try to set a specific property through this hash it won’t work as the old hash will be used each time. We always have to set the full hash each time. Typecasting in Postgres can be a little tricky as it will raise an exception if any of the data doesn’t convert to the target datatype. It can be necessary to add another WHERE clause to ensure that we only fetch the records that have a value that can be converted. If all we’re going is a simple string comparison then it’s more efficient to use the @> operator instead. This will check to see if the hstore on the left contains the one on the right. The advantage of this is that it will use the index if there is one. Now that we know how hstore works let’s apply it to our application’s product form. Instead of having each book’s author’s name in the description field we’ll have a separate field for the author. We’ll start by adding a new field to the form partial. We’ll need accessor methods on Product for this new field. It would be nice if we could take advantage of the new store features that Rails 3.2 provides. There’s a store_accessor method that will do exactly what we want. We pass it the name of a column, in this case properties, and a list of attributes that we want to make accessors for and this will create a getter and setter method. Unfortunately this isn’t compatible with the hstore gem. Presumably it will work with Rails 4 but for now we’ll have to this manually and write getter and setter methods. The getter method checks that the properties hash exists and if so returns the value of its author key. The setter method sets the full hash to the value of the existing hash (or an empty hash if doesn’t exist) and merges the new value for the author key. The final change we’ve made is to add the new attribute to the list in attr_accessible to make it accessible through mass assignment. Reloading the page now shows the new field and if we fill in this field, submit the form then go back to edit it again we’ll see the value we entered in the author field. We could write similar getter and setter methods for the other hstore attributes but instead we’ll use meta-programming to generate them. Now we have a an array of the attributes we store in our properties hash and we loop through them and call define_method on each one to create each getter and setter. We also call attr_accessor to add the attribute to the list of accessible attributes. Once we’ve added rating and runtime fields to the edit and show forms in the same way we added author we can try this out. If we edit one of our films then visit its page we’ll see the new fields listed. One thing we should do is make the edit form smarter so that it only shows the author field if we’re editing a book and the rating and runtime fields if we’re editing a video. Doing this is a out of the scope of this episode, however. An alternative approach to dealing with hstore attributes in a form is demonstrated in this example app. This allows us to add and remove attributes dynamically and store them in hstore. This is a less strict approach that we have in our application but it might work well in others. One benefit to having accessor methods to hstore attributes is that it makes validations easy. If we want to make sure that any entered runtime value is valid we can do so in the usual way. We can now use this scope to find, say, all the products with a rating of “R”. A good refactoring to do on our Product model would be to move the code that creates the accessors for each attribute into some kind of method call to clean the code up, but we’ll leave this as an exercise.